Den 9 and Den 13 have teamed up to form one den this year! We enjoyed a great first meeting together on August 27th. We welcomed one new scout into our group: Joey! He will be the first scout of Pack 530 to complete the new Arrow of Light requirements. The boys were asked to research scouting in another country with a partner and to write an article about what they learned to post on the den website. Enjoy the results of their research (with some spelling and punctuation editing)! They had different ages. They provide amazing experiences. They had a diet of self respect. They had cub scouts like we do. They have people for branches to help volunteer. Their logo is very similar to ours. They also have parent volunteers to help with every scout project. Scouting in Japan was first introduced in 1909. There were different age groups for different divisions of scouts. They were: beaver scouts (6-8), cub scouts (8-11), scouts (11-14), venture scouts (14-18), and rovers (18-24). Scouting is still going on today in Japan, so you should join the scouts of Japan! Scouting in Germany started after World War I in 1909. It became involved with the German Youth Movement. Some of the scouting closed and the scouts had to join the Hitler Youth. They had Joey Scouts for boys 6-7 years. They had cub scouts just like we do for boys 8-10. They had self respect with amazing experiences. They had people from branches to help volunteer. Their logo is very similar to ours. They also had adult volunteers to help with every scout project. Scouting in Japan was started by a professor in Hiroshima College in 1909. There were many levels: beaver scouts ages 6-8 years old, cub scouts ages 8-11 years old, scouts ages 11-14 years old, venture scouts ages 14-18 years old, and rovers ages 18-24 years old. As you can see, scouting in Japan was different from scouting here. This is the Canadian Scouts that have lasted 100 years and have 17 million youth in the group. You can be 5 to 26 years old. They have 288,084 youth in the Canada troops. They have 33,524 adults. They have Beaver Scouts, Cub Scouts, Scouts, Venturer Scouts, and last Rover Scouts. The cub scouts are 8-10 years old where we would be. This is what Canada troops are. The scouts in Canada are a lot different than the American scouts. 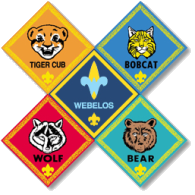 There are 6 stages of Canadian scouts: the beaver scouts, cub scouts, scouts, venturer scouts, and rover scouts. The Canadian scouting was based on 3 principles: Duty to God, Duty to Others, Duty to Self. For over 100 years, the Canadians have been doing this and over 17 million children have done it. * Develop a written code we can use in our den. We will vote for our favorite and adopt it as our den code at the next meeting!